To Oregonians, family comes first. It was true in 1992 and is still true today. 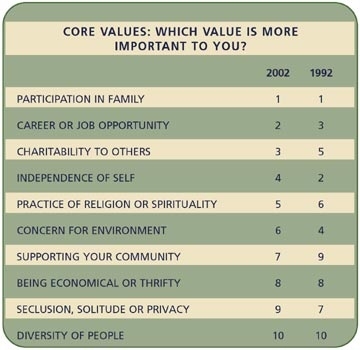 In fact, when asked about their "Core Values," Oregonians have remained basically steady between 1992 and 2002. 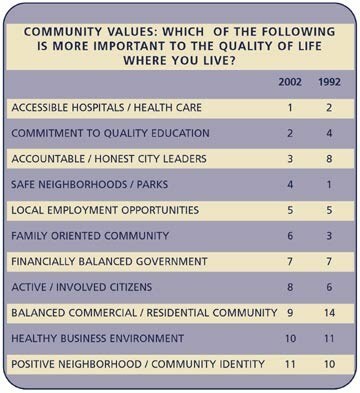 Additionally, they consistently rank secure accessible health care and quality public education as top priorities. Oregonians value these services for themselves and for their families. "Being there for my kids and my husband and taking care of my parents - that's what's important to me." "If you don't have a good education, you can't get a good job and you are not going to be able to make things better."